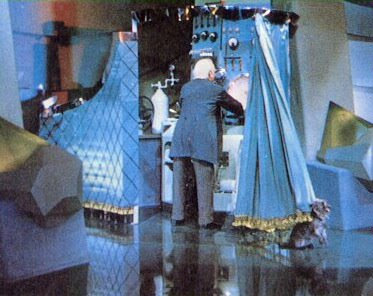 SpeEdChange: Who's Behind the Curtain? I ended up in two big educational debates this past week. One was about "clickers" - those "Classroom Response Systems" that are increasingly infiltrating our classrooms. The other, about Washington, D.C. Schools' Chancellor Michelle Rhee and "the reform agenda for schools" coming from America's financial elites. In these debates I was abrupt, and cruel (sorry, David Brooks, I know you are only doing your job keeping Wall Street Republicans reading The New York Times, I shouldn't have gotten personal - and a very big apology to Roger Cohen, another NYT columnist, who I blamed in bizarre mix up), and perhaps, in a few moments, coherent and convincing. I read wonderful stuff from passionate people too. But stepping back, I want to bring both these debates together, because, in the end, they are both about power, about who gets to control education in the United States (and thus who the "winners" in education will be), about who is pulling those levers from behind the curtain. We have two tidal events occurring here, but these are not natural tides, they are invented ones. And when people seek to create tides, I think we should always ask why. So, in a higher educational establishment which, for example, has refused to even load their computers with free universal design software technologies, much less invest in those systems which might transform education for a vast array of students now failed by the system, we see broad adoption and massive spending on "clickers." And, in a climate of broad K-12 system failure, with hundreds of fascinating alternative success examples from around the world, the US media establishment (Disney, Time-Warner, GE, Viacom, NYT Company) has declared one "leader" - a leader with no measurable accomplishments and a confrontational style which seems to drive almost everyone away - as education's messiah. But let's start with the "clickers." Michael Bugeja, a friend and technology in education sparring partner (and the Director of the Greenlee School of Journalism at Iowa State University) wrote a piece this past week in the Chronicle of Higher Education - a paid publication I rarely read and a paid website I rarely visit. His commentary, Classroom Clickers and the Cost of Technology, tracked the adoption pattern of these one-way communication systems on university campuses. "Marketers seem to know our business better than we know theirs. That was apparent a few years ago, when publishers introduced infrared clickers bundled with specific textbooks or series of textbooks. In a class of 400 students, each of whom would spend $40 for a clicker, many institutions paid for the purchase and/or installation of receivers, in effect helping to sell the company's products. Companies suggested clickers for multiple-choice questions based on a book's content, an easy adaptation from previous instruction booklets with answer keys — not exactly innovative, but cost-effective, making books appear interactive overnight." Bugeja - who I often debate regarding technology adoption in the classroom - but whom I deeply respect on the subject, even when we disagree - is concerned with the cost/benefit calculations behind the "clicker decision" as well as the key question of who is pulling the strings. I have been "clear" about my position on clickers - calling them "Instant Anachronisms" and "Coercive Technology." Even when I see some possible benefit - bad lectures may be marginally better with clickers than without - I regard this technology as "insufficiently transformational" - that is, not worth the costs in a nation where students already can not afford higher education. But the key issue here is "why"? Who has pushed this technology, and to what end. I joined in a fascinating debate on this at the blog of Derek Bruff, a math professor and director of the Center for Teaching at Vanderbilt University, and major "clicker advocate). If you follow that debate, you'll see where it leads. Why is Turning Technologies selling clicker receivers cheaply? Is it because it hopes to tie Vanderbilt's faculty to the textbooks of its partners? Those partners? Thomson Learning, Glencoe McGraw-Hill, Dell Computers, Steljes Group. Oh. The primary distributors of the $150 textbook are "giving away" (sort of) systems which will seemingly guarantee the continued sale of $150 textbooks. Those marketing Universal Design Technologies - Freedom Scientific, Text-Help, Kurzweil, etc, can't afford to "persuade" universities this way, but Thomson Learning (or is it Cengage now?) sure can. And thus we find "clickers" everywhere, and struggle to discover transformational technologies on our campuses. Dr. Bugeja would want me to suggest that we always follow these trails. And when I sat in a meeting with Google's Jeff Keltner regarding Google Apps for Education this semester, I heard all the questions. Why would Google give away a campus email and collaboration system (stripped of the advertising which is Google's only real revenue stream) for free? What's the catch? Keltner (as Google execs tend to be) was blunt. People who use their tools tend to use their search engine and, quote, "we're pretty good at monetizing that." And, "we see students as future leaders, if they become comfortable with our tools now, they'll tend to use them later in their lives." Yes this is insidious seduction, it sure is, but let's consider this cost/benefit balance. What does your university (or school) spend on email? If that email system was free, could you not raise tuition? Could you hire more faculty? Could you put WYNN on more campus computers? But here's the thing, Google will seduce, but they won't bribe. They won't hand a toy to a faculty member at a conference which transforms that prof into "a techie" in the eyes of his or her peers. They won't give out free books either. So their "leverage" in campus decision making is limited. As we may deduce from observing the number of campuses spending their own and student dollars on "clickers" vs. the number cutting costs by adopting Google Apps for Education. The Universal Design Tech companies? Without the profits from 700% textbook markups, or the alternative revenue stream of Google, they struggle to bribe or seduce. Even when their products are free, they remain of little interest to universities - despite, well, what's the cost/benefit relationship there? 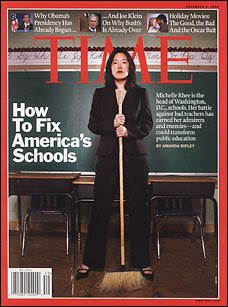 Which brings us back to Michelle Rhee. Who's marketing her, and why? Rhee is part of a broad push by America's true "old guard" to ensure that education doesn't really change. The same folks at Harvard and Penn who offer our minorities the lowest educational expectations possible through Teach for America and KIPP Academies, are selling you Rhee, and lowered expectations for all schools - except of course, for the schools attended by the children of those elites. There is a reason the television networks and New York Times and Time-Warner love TFA and Rhee. These organizations are run by people with power, and by people who would rather not share power. So they have adopted the ultimate in reductionist standards. "If we had even decent education - or even enough teachers of any kind - in most of the places it places its students, then [TFA] would be a step down," a commenter on this blog said yesterday. Right, so here's the standard: Teach for America, or Michelle Rhee's DC school system, is better than not having schools at all. No, she doesn't give a crap. She wants her African-American students prepared for the lowest possible jobs on the economic ladder. That way (perhaps, in her unconscious thinking) they will not threaten the success of her small minority group - a group which has found itself accepted by the powers-that-be because it isn't big enough to be threatening. Of course I have a different view of reading than Rhee, and of language itself. First, I know that there are lots of ways "to read," and second, I know that when children are inspired to learn about things, they tend to want to learn to read (in one form or another). As opposed to the Joel Klein-Michelle Rhee-KIPP Academy-George W. Bush notion that reading is a skill which should be learned outside of the context of interest-based education. But then, my goal is opportunity, and my belief system - not being market-capitalist in nature - doesn't think an underclass is a good idea (to hold down upward pressure on wages). Rhee is not important, of course. She's racist in her expectations and racist in her strategies, she's not an educator at all in the real meaning of that term, she talks a great deal but has little actual impact in her job. But Rhee being hailed as the educational messiah is important. Like those who favor TFA solutions - the Rhee idea is to NOT change US society. Yes, we'll make impoverished minority groups marginally more competent - thus improving profits at the top and reducing the cost of the dole. But no, we will not empower those groups by empowering their children. Teaching them to be creative 'will have to wait' (forever). Teaching them to find their own learning styles - thus accepting cultural change instead of social reproduction - is dangerous (as it always is for those at the top). We lower expectations. We test meaningless things (Time: "The ability to improve test scores is clearly not the only sign of a good teacher. But it is a relatively objective measure in an industry with precious few. And in schools where kids are struggling to read and subtract, it is a prerequisite for getting anything else done." Really? Anything? You can't teach the physics of a bouncing ball to a non-reader, or the love of literature?). We strip time away from what is precious to children and force them into chanting. We enforce white majority cultural norms and deny identity. We argue that teachers should be paid according to the "short term gain" rules that worked so well for traders at Citigroup and AIG. And this is all brought to you by the wealthiest people, and the largest old-line corporations in the country. Because, I'll say it again, they have no incentive to allow those below them to succeed. Follow the money my friends. When information flows freely to as many people as possible, Google makes money. When information is expensive, those who sponsor "clickers" make money. When the kids in Washington, D.C. schools fail, there are fewer challenges to the children of New York Times and Time editors for slots in Ivy League schools. When Washington, D.C. schools focus on "the basics" students from there will not beat out the son of a GE exec for a spot at Carnegie-Mellon. When you see invented trends, pull back the curtain, see who's pulling the levers. It is important. Hi, Ira. I'll make just a couple of quick comments here since we've already had much discussion over on my blog. One is that it's a bit of a reach to say that a particular clicker vendor is trying to sell textbooks. A couple of years ago, clicker vendors often partnered with publishers to bundle their clickers with textbooks as a way to entice faculty to adopt clickers. The clickers were cheaper for students when bundled, but, of course, bundling made the used textbook market more complicated for students. These days, however, many campuses have standardized on clicker systems, meaning that students purchase clickers in their first or second years on campus, then use those clickers throughout their coursework. This practice has meant that there's far less bundling of clickers with textbooks going on now than there was a few years ago, so the clicker vendors and textbook publishers aren't partnering in quite the same ways they once were. I think it's safer to say that clicker vendors are making their receivers available for free so that they'll sell more clickers, not more textbooks. Thanks for continuing this discussion. I know we disagree on a few key points, but I've enjoyed the conversation. I do follow you, and I am perhaps over-reaching, but without the push of textbook publishers at the beginning I tend to doubt this technology would have reached critical mass. We can - and we should - always try to take what the marketplace hands us and use it to our own advantage. I believe that you are doing that, just as I am suggesting using other "marketplace gifts." But I think - and I actually think DR. Bugeja has helped me with this - is to understand the market's role in this. This is true with TFA and people like Joel Klein and Michelle Rhee as well. The participants in TFA are not "evil." They have been taught that they are helping. Klein and Rhee probably do believe in what they are doing. It is the "projects" themselves which are colonial in nature, and thus, to me, extraordinarily problematic. Perhaps some within those projects can turn them, as well. We need a "Roger Casement" within those ranks. Thanks for the conversation, it's been great. Really great points in this post. You say a lot of things I've been thinking about. I also put up a post this morning about Joel Klein and interest-based reading and how the Kleins and Rhees talk about their program as bringing equity when it does the very opposite. Calling the Rhee program out an out racist whether you look at kids or the teachers in DC is powerful stuff. I just updated another post on Rhee by quoting a bunch of these points. I enjoy your blog and I enjoyed the interview on Open Education. I've been getting some interesting responses since I wrote about it if you are interested. Teach for America certainly causes some strong emotions in people.